Yesterday I got all fired up and a little bit sentimental and wrote about the recent news of 100% art cuts in Newcastle on We Are CAN. I wrote a defence of exactly why the arts matter and managed to talk about Weimar Germany, Rubens and my mother. They say its grim up North. While I don’t like to succumb to stereotypes, there is some meteorological fact to the saying. But colder temperatures and wetter weather aside, things are at risk of getting a lot grimmer in the north of the country after Newcastle Council announced it was planning to cut its arts funding. Newcastle Council said they plan to cut all funding to arts organisations, including the Theatre Royal, Northern Stage and Live Theatre. Along with that , they propose a 50% cuts to museums, and a cut to libraries – which means all but two libraries will close in the city. As many have pointed out, this is something of a self-inflicted disaster: gradually destroying the things which not only sustain and enrich its residents, but which also make Newcastle an appealing cultural hub which, along with Manchester, offers a counter-balance to the capital, London. The decision is not just relevant to a city where recent cultural growth has sparked something of a renaissance; the news of the 100% cuts reverberate on a national level as the position and strength of the arts continues to be threatened by short-sighted policy in the country as a whole. Whether we think of the Arts Council’s plans to cut more than 100 jobs, the proposed English Baccalaureate which would entirely sideline subjects such as Drama, Art and Design, or the projections that arts funding across the country will be down by 16% compared with 2009-2010 by March; the overriding impression is that the people in authority don’t seem to appreciate the real value of culture – as a necessity rather than a luxury. Comparisons with Germany in the pre-war period always seem a bit extreme (perhaps its only me, coming from my WW2-centric education that makes them), but the story of the Golden Years of culture in Weimar Germany and the cultural decline suffered as a result of the Wall Street Crash and Great Depression holds some relevance here. Fascism grew in strength for many reasons, but there was a cultural bereavement involved and the Nazis only perpetuated this by banning ‘degenerate’ artists and burning books. The point is that art, theatre, music: all of these things were responsible for a feeling of satisfaction and contentment in Weimar Germany; their loss was strongly (or should I say extremely) felt. The arts aren’t just a luxurious extra which we can all live without when pushed, they’re just some of the things which make the daily grind of life seem worthwhile. There’s a debate about class which I won’t really go into here, although it is perfectly expressed on Newcastle & Me; we’re at risk of the privatisation of culture and the return of the arts to privilege rather than access. But you don’t have to be privileged or a Northerner to understand just how much these cuts will hurt. Our relationship with the arts is, more often than not, profoundly individual and personal. Would I have loved books enough to study them for three years if it hadn’t been for a library bus which visited my village every week replenishing my stock and convincing me that the excitement could be sustained? 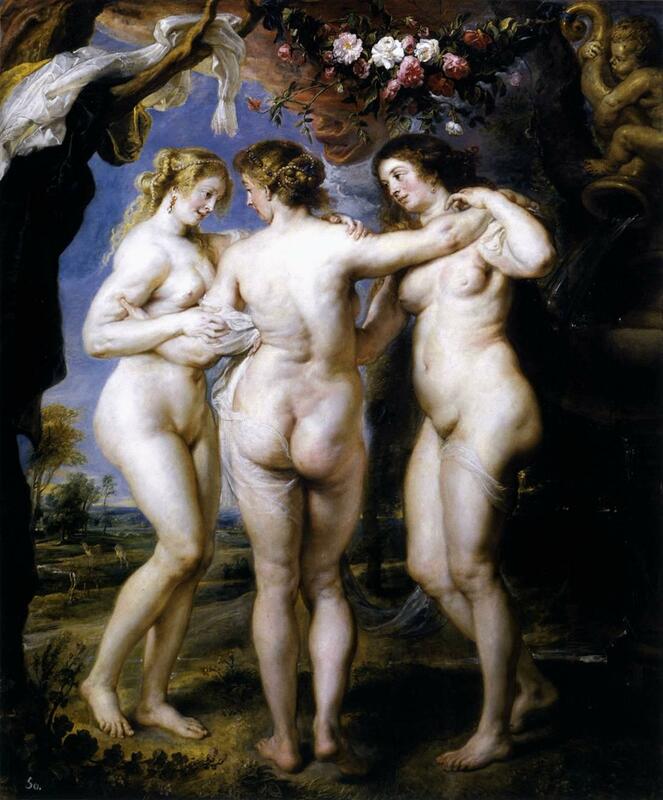 I love the Rubens in the Prado because as a child they reminded me of my mother naked; and when I got fired it was the Tate I retreated to – in fact any time I get a little sad, an exhibition is my first resort. All of this means very little to anybody but me, but that doesn’t mean that other people don’t have equally universally-irrelevant but emotionally essential stories to tell. It’s very easy to silence protests with a casual and cutting: “It’s either the hospitals or the theatres, what would you rather?” and it’s much harder to set up any kind of moral defence that doesn’t sound bourgeois or indulgent. While I’m not advocating that arts be given priority over healthcare, it is important to make a case for why the preservation of culture really is necessary. It’s no secret that the curriculum laid down by our education system is increasingly plotted out, narrow and uniform, but it’s a richness of the world that our lives just aren’t like that. As important as an education is, this richness usually comes from the culture that surrounds us. A little bit of suggestion is often far more significant than blatant indoctrination (I always loved the books I chose to read on my own, but tended to hate the literary masterworks I was forced to read at school). There is something often silent, subtle and unconscious which culture gives us, but that doesn’t mean it isn’t worth loudly fighting for. Newcastle will feel its 100% cuts, and I can only hope that it’s more of a cry for help from a government which has dramatically slashed its local funding, than a genuine sacrifice. The latest an interview could possibly be? Call it guilt or inspiration, here it is: my interview with artists Alex Lewis and Edward Wallace who curated their own show together at Copenhagen Place. It is in reaction to this comment during my interview with Edward Wallace and Alex Lewis that Wallace finally snaps: “God this feels like Blind Date”. I am sitting opposite the pair and trying my best to find a conversational balance, generously switching between the two as I address each question. 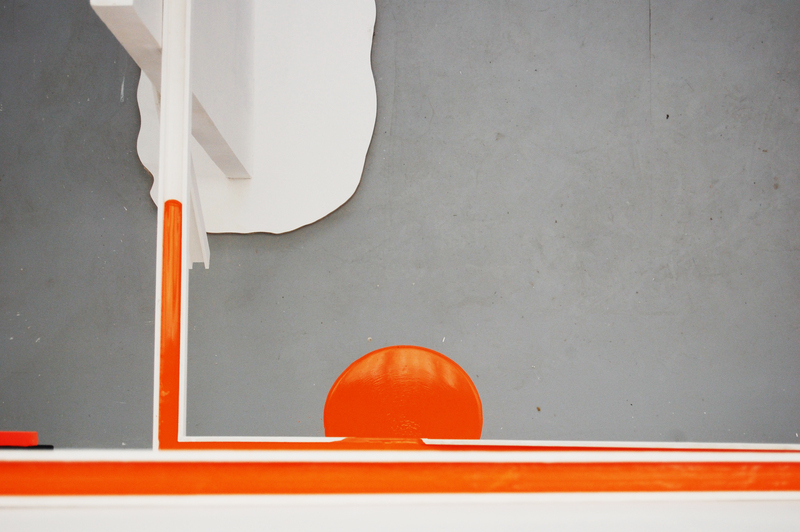 My attempt to achieve interview-equilibrium is mimetic of Lewis & Wallace’s partnership for the exhibition Static Dynamic at Copenhagen Place, where a single collaborative work, a paint control system, linked their practices together. Running bright orange acrylic paint from the ceiling into the exhibition space it also threatened to disrupt their individual works. Sometimes the pair seem to be in perfect accord, but pitch a question in a certain way and instead of neutralising the awkwardness, a violent reaction occurs. The difference between their two practices is perhaps clearest when I ask them about the influence of cartoons which are present even when stripped of character and form and reduced to a colour or an energy. For Wallace the fascination is with the mechanics of animation and the construction of layers; his self-painting works have come to echo the process of animation in their laborious set up and quick conclusion. 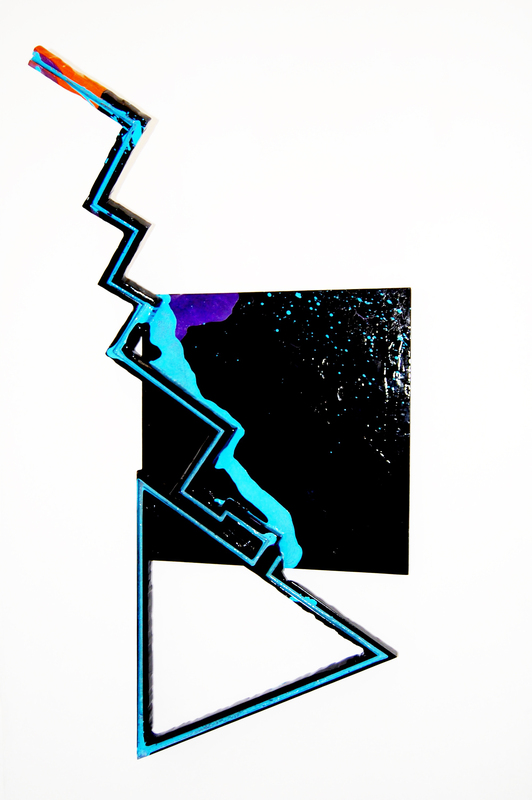 For Lewis the interest is “inverse”; the sparseness of a frame appeals to the possibility for free-association in the viewer and is a part of the openness of his own source material. This antithesis is evident in the duo’s personalities too. While Wallace zooms in on everything like the Warner Brothers’ eclipse with a ‘That’s all Folks’ style flourish leaving me breathlessly unable to keep up, Lewis pans out of the scene offering a wider frame for context and reflection. By playing with synthetic and natural elements in Static Dynamic Lewis & Wallace deliberately experimented with levels of awkwardness. There is a violence inherent in the vibrant colours and graphic patterns of their works which made the show crackle with an aesthetic volatility. 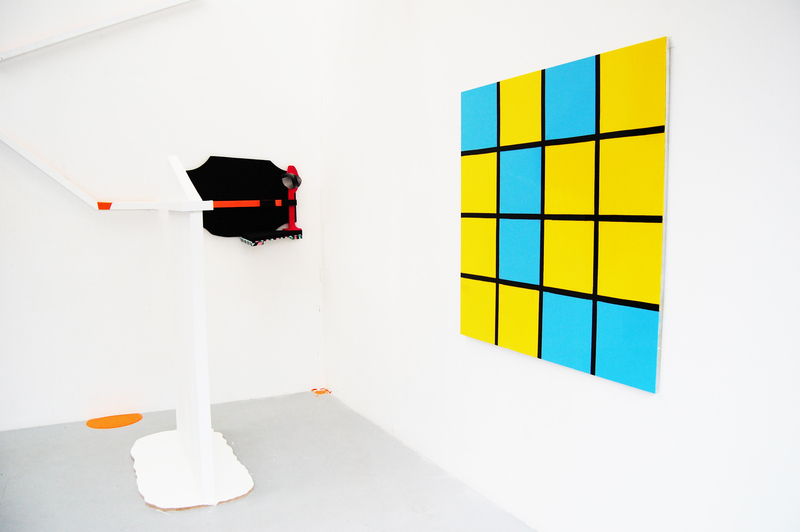 The anticipation and tension of their collaborative self-painting work forced the synthetic awkwardness of the acid colour palette against the natural awkwardness of the space. The success of this joint work reverberated throughout the exhibition, its volatility feeding and fuelling the other works with a single energy. Wallace wondered if they had laid the ‘awkwardness’ on a little too heavily, but it was this brightness that caught the viewer’s eye. 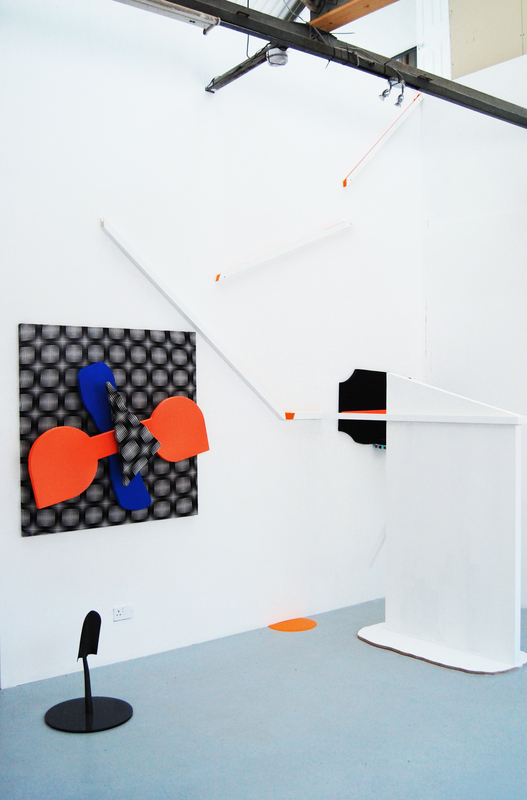 Their playful antagonism is fresh and rare within the slick formula of contemporary curation. WW Gallery is pleased to present All the Dead Dears, an exhibition of drawing, painting, sculpture and print by Ross Chisholm, Sarah Gillham, Mindy Lee, Emma Talbot & Sarah Woodfine. 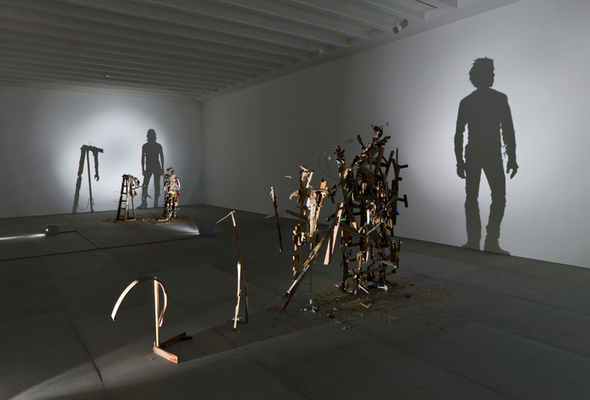 Curated by Mindy Lee and Sarah Gilham, All the Dead Dears is the first in a new programme of exhibitions guest-curated by prominent artist/curator duos, which will continue throughout 2013 at WW Gallery. A sinister lure lurks at the heart of ‘All the Dead Dears’, reviving what once was into a new and otherworldly state. Sensual desire is twisted and ruptured; this disrupted decadence tips in and out of states of loss, emptiness and longing. Drawing on personal memories, rituals, invented mythologies and historical icons, each artist references and retells the past. As these moments are invoked an uneasy tension and a jarring sense of the ‘out of time’ sets in. Time is spliced together, compressing different moments into hybrid narratives which fuse and cyclically loop. These narratives are trapped in flux where they are continually evolving, unravelling, pulling apart, lacerating, breaking or dissolving. As tension mounts things appear to move out of all control. The mundane or accidental take on increasing significance and theatricality. Public and private personae become interchangeable, exposing a psychological release which is consumed and reabsorbed. The opulence of surface and subject tempts the viewer further into the world of All the Dead Dears. Yet the beauty of seduction and the temptation of desires in turn unveil awkwardness, violence, horror and the macabre. 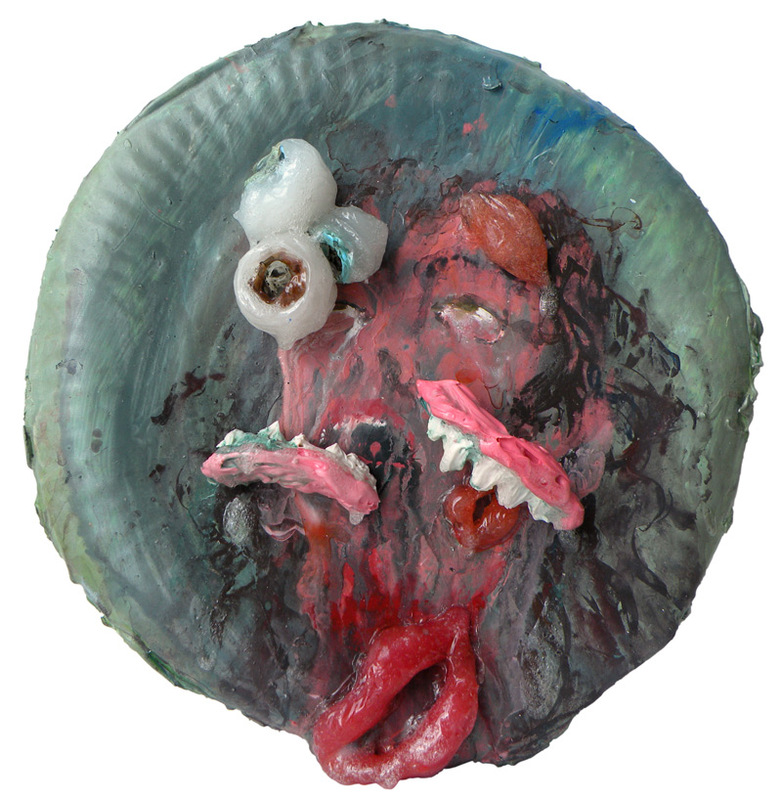 Trapped between attraction and repulsion in a compressed present, the viewer is horribly compelled to indulge. Ross Chisholm appears courtesy of IBID Projects, Sarah Woodfine appears courtesy of Danielle Arnaud. Of the many things keeping me busy recently, there has been planning for the upcoming East London Fawcett event and campaign launch, ELF Presents: Women in Sport. Here’s an article I wrote as a preview for the Hackney Citizen. Come along next Saturday if you can. To mark the International Day for the Elimination of Violence Against Women, East London Fawcett Group is hosting an event on Sunday 25 November to highlight women in sport. Celebrating both the achievements of those who have been successful in a male-dominated industry and highlighting the challenges faced by women in the sporting world, this will be the launch of an ongoing campaign for a level playing field in women’s sport. 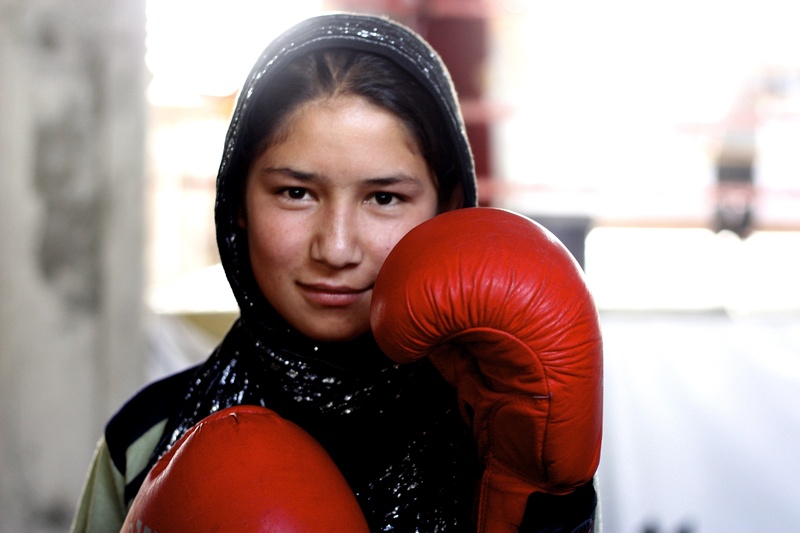 The event will be held in the Body Studio on Rivington Street which is run by director and founder Margaret Pope, and hosts the girls-only boxing group, Girls in Gloves: a playful choice as the event aims to raise funds for a group of women boxers in Kabul. Stylist Magazine’s Francesca Brown, who leads the publication’s Fair Game campaign, believes sport is “the last bastion of sexism”. It’s certainly true that sport still has an overwhelming male identity. If a woman is ‘sporty’ or has an ‘athletic’ body then she faces being seen as masculine. In a world where we are supposed to have equality this is definitely a very limited perception. Since Olympic fever swept the nation, gossip magazines and other parts of the media have been asking women if they ‘want abs like Jessica Ennis’: one small sign that our attitudes to sportswomen might be changing. The Olympics certainly seems to have given us plenty of new female role models to aspire to. East London Fawcett’s campaign is pitched during a landmark year for women’s sports. This year there were more British women taking part in the Olympics than ever before (262 in total). These women also made up a higher proportion of the overall team than in any previous games (48%). On an international level, London 2012 was the first time that women were able to participate in every sport and the first time that all competing countries had female athletes. The campaign launch includes guest speakers such as Jamaican athlete and triple-jumper, Trecia-Kaye Smith, journalists Laura Williamson and Francesca Brown, along with director of the Body Studio, Margaret Pope, and Founder of Girls in Gloves, Naomi Gibson. There will also be a special screening of Fighting for Peace: Kabul’s Female Boxers, a photofilm by multimedia journalist, Melanie Brown. Sunday 25 November 2012, 3-5pm.